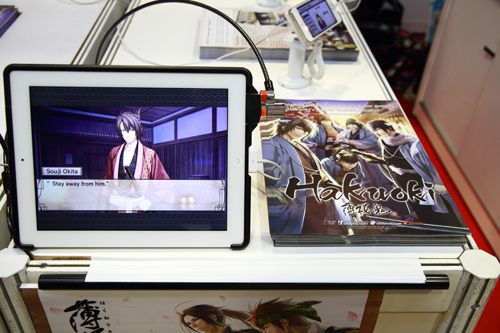 Something that caught our eyes at Anime Festival Asia (AFA) Singapore 2014 was the English port of hit Otome game Hakuoki for mobile by digital company Gloczus. 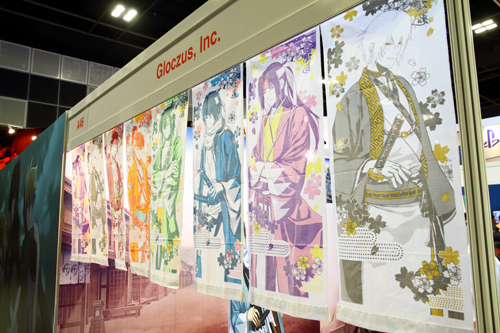 The Gloczus, Inc. booth at AFA 2014. Thankfully they left the Japanese voices in the game with English subs, and this would no doubt please many fans. Whilst trying out the demo at AFA, it was impressive that they managed to keep the translation highly accurate whilst maintaining the slight subtleties in Keigo (Formal Japanese Speech). Some words such as Ronin were left as it is and it shows the quality of the translation. One thing we’ve always looked out for is grammar and syntax in a port, and we’re glad they delivered on both counts. 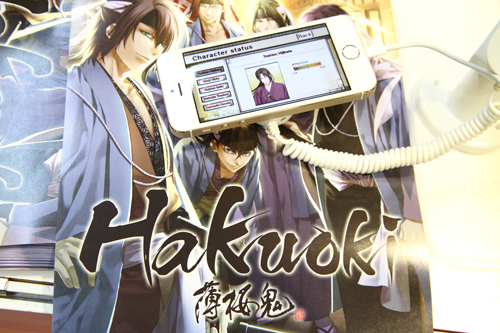 Finally fans of the popular Hakuouki have an opportunity to enjoy the game in a convenient format. The mobile format did not have any loss in performance despite being a port from the original game and we could feel the the effort from the guys in Gloczus that they managed to make the format accessible for all mobile devices without any of the lag found in other mobile games. We could not feel any corners that were cut whilst playing the game. The large total file size of 1-2GB might keep away some fans but it is not overly ridiculously in this time and age. It looks really good even on the small screen. The game uses a microtransaction model which costs about ¥400 per chapter, or ¥2800 for all 10 chapters + 1 additional chapter. It starts off with a free prologue for you to try out the game, which is a nice demo if you’re wondering about the translation and game quality. It’s pretty affordable considering the quality of the release and this model has been found in other mobile ports of games. However these prices are not finalized and it could be even cheaper because of market segmentation. The release date is scheduled for December, and the game will be available in many regions including South East Asia and Europe. However due to complications with licensing, it would be unavailable to fans from the United States. The company is also planning to release the game in Traditional Chinese in Hongkong and Taiwan, with additional plans in China. Depending on the performance of Hakuoki, they would like to translate the sequels of Hakuoki and other Otome games. It seems like they also would like to bring some other Visual Novels such as a PC version of Neptunia for the male audiences to enjoy.